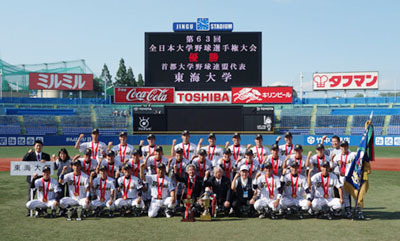 Tokai University’s Baseball Club, reigning champion of the Tokyo Metropolitan Area University Baseball League (SBBL) won the 63rd All Japan University Baseball Championship competed by 26 regional champions for 6 days from June 10, 2014 in Tokyo. Tokai University produces quality graduates including a large numbers of leading athletes such as Tatsunori Hara (55), manager of Tokyo Yomiuri Giants and the recipient of the 2009 Best Manager Award of the International Baseball Federation. In an expression of sympathy to the recent demise of his father Mitsugu Hara who once managed Team Tokai (see BFJ obituary of June 3), Tokai players and coaches ribboned their sleeves of their jerseys during the Championship. Awards: MVP: Takumi Oshiro (Tokai), Best Pitcher: Yuki Yoshida (Tokai), Leading Hitter: Takumi Oshiro (.533), Fighting Spirit Award: Yudai Hamaguchi (Kanagawa), and Special Award: Masayoshi Tanaka (Soka). Tokai’s win is most timely for SBBL which is scheduled to send an All Star Team for friendly games to Australia early August to commemorate the League’s 50th Anniversary. Day 1 at Meiji Jingu Stadium: Fuji Univ. 0-1 Fukuoka Univ., Kanagawa Univ. 7-0 Nishinippon Institute of Technology, Dohto Univ. 8-1 Fukuyama Univ., Aichi Gakuin Univ. 5-0 Tomakomai Komazawa Univ. At Tokyo Dome: Matsuyama Univ. 0-6 Fukui Univ. of Technology, Soka Univ. 4-0 Bukkyo Univ., Shizuoka Univ. 1-2 Higashi Nippon International Univ., Kyushu Sangyo Univ. 1-0 Hiroshima Univ. of Economics. Day 2 at Meiji Jingu Stadium: Sendai Univ. 3-1 Fukuoka Univ., Kanagawa Univ. 3-1 Keio Univ., At Tokyo Dome: International Budo Univ. 1-4 Ryukoku Univ., Naragakuen Univ. 1-3 Ritsumeikan Univ., Asia Univ. 2-3 Soka Univ., Fukui Univ. of Technology 3-2 Yamanashi Gakuin Univ. Day 3 at Meiji Jingu Stadium: Dohto Univ. 0-3 Aichi Gakuin Univ. At Tokyo Dome: Higashi Nippon International Univ. 0-1 Kyushu Sangyo Univ., Tokai Univ. 2-0 Ryukoku Univ., Ritsumeikan 1-4 Osaka Univ. of Health and Sport Sciences. Day 4 at Meiji Jingu Stadium: Sendai Univ. 1-3 Kanagawa Univ., Aichi Gakuin Univ., 2-1 Fukui Univ. of Technology, Soka Univ. 3-2 Kyushu Sangyo Univ., Tokai Univ. 4-3 Osaka Univ. of Health and Sport Sciences. Day 5 (Semi Finals) at Meiji Jingu Stadium: Kanagawa Univ. 2-1 Aichi Gakuin Univ., Soka Univ. 2-7 Tokai Univ. Day 6 (Final) Kanagawa Univ. 0-2 Tokai Univ.